Restaurant Expert Witness Howard Cannon Warns of Foodborne Illness Danger. 68% of Foodborne Illnesses Occur in Restaurants. Food-borne diseases are illnesses contracted by eating contaminated foods or drinking contaminated beverages. According to the CDC (Centers for Disease Control and Prevention), approximately one in six Americans become ill each year from food-borne diseases, resulting in over 3,000 deaths. This is why Restaurant Expert Witness Howard Cannon Warns of Foodborne Illness Danger. There are more than 250 different food-borne diseases caused by viruses, bacteria, parasites, toxins, metals and prions. Symptoms of food-borne illness range from mild gastroenteritis to life-threatening neurologic, hepatic, and renal syndromes. Food-borne illnesses cost the US about $78 billion per year, so each outbreak prevented can save up to $3 million. More importantly, preventing outbreaks can save lives. 68% of all foodborne illnesses occur in restaurants. 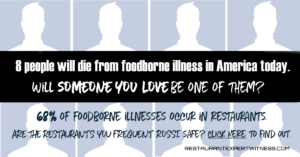 There’s one question you need to ask to make sure the restaurants you patron are safe and up to date on regulations regarding prevention of food-borne illness: Are you ROSSI safe? The US Food and Drug Administration (FDA), the Centers for Disease Control and Prevention (CDC), and local public health authorities primarily regulate the quality of food and controls used to prevent food-borne illnesses are regulated primarily by the. Restaurant OSHA Safety and Security by ROSSI, Inc. CEO and Restaurant Expert Witness Howard Cannon is the definitive source for information on the industry standards and best practices that restaurant owners and managers must know to keep employees and customers safe. Ask a restaurant manager today: Do you have a copy of Restaurant OSHA Safety and Security?